Update: 9/6/12: I am writing a follow up to this piece and expanding on the ideas in this post. Watch this space! I hope to be finished today. While seated in my chair, one arm tethered to a machine and the other constrained by a blood pressure cuff and feeling for all the world like the character in “A Clockwork Orange” suffering through aversion therapy, I daydream. I dream about being at the beach, or with the wind in my face, or somewhere, anywhere, other than where I am at the moment. I resent the hard, cold environment, the noise, the pain, the clocks, the posts and walls, the white coated staff, the antiquated equipment, the paint color, the cabinets… If I let myself go, my resentment will turn to hating the place. It’s not this particular clinic that I come to resent, it’s all “clinics”. They are clearly designed from the perspective of the delivery of dialysis, not from the patient point of view. The amenities are certainly better where I am now than the “Center from Hell” but they could be better. We’re supposed to be moving in October to a new location but, curiously enough, with no input from the patients. Davita figures it knows what we want because it knows what we need medically? I dream of a place where a dialysis center is not just a medically-oriented facility, where there’s no clinical atmosphere, the treatment chairs are comfortable, it’s quiet, there are no bright lights, etc. Something like a library but for dialysis. Something like a day spa but without the facials. 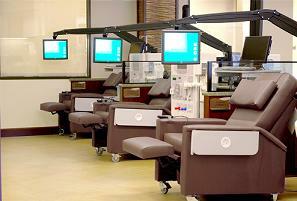 This is much closer to what an ideal dialysis center should be like, isn’t it? Well, a place closer to that of my dreams may exist here in the US. It’s called Dialyspa. View their promo video. Now tell me, isn’t that a good idea? 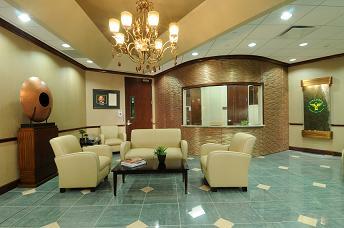 Isn’t this more like what a center lobby should look like? Four shifts, including Nocturnal, are available for maximum flexibility in scheduling. I like all these ideas. The staffing, of course, is a real benefit. Often in centers with less staff, you get less attention and during patient shift changes, we have to wait for another patient to get on, or off, before we can. I don’t complain. I don’t like waiting, but I do. I like that they offer Nocturnal Dialysis. For working types, that really makes sense. I also like the ambient lighting. The bright, neon, office lighting is really… well… rude. They don’t seem to offer all the amenities of the UK system like food, blankets, tea and biscuits (love that), but I suspect they would be much more likely to offer those if it’s suggested… unlike “The Center from Hell” where I offered my list of 32 improvements and was turned down on every one of them! I particularly like the idea of personal, touch-screen monitors and TV so I can more easily browse the Internet. Using my tablet/pad (see “Dialysis and Social Networking“) requires me to prop it against the personal TV and operate it with one hand. That’s not always easy. If the TV is not positioned just right, touching the pad will cause the TV to shake, swivel, or swing away. Having a large screen and touch-screen is certainly part of my dream. Nice chairs and TV/Monitors with Internet! The fact that they have back-up generators may seem irrelevant to patient-centered care but if you’ve had the power go out while in treatment, you’ll appreciate this amenity. It’s costly and most for-profit centers consider it a luxury. They aren’t required by law to have it, so they don’t. But for some very vulnerable patients, this could save their life and the for rest of us, it means completing our treatment without interruption. That’s HUGE! It’s also a clear indication that Dialyspa is patient-centered. Now, be cautioned, I haven’t visited or used the center. I’m only responding to their website and video but, even if they aren’t everything they claim to be, they are light-years ahead of the curve. I love the idea that they are patient-centered. I am totally committed to “Patient-Centered Care” and wrote about it in “Dialysis and Patient-Centered Care” but that posting was from the medical orientation. The concept of patient-centered care needs to include the environment, attitude, and amenities of the center. Dialyspa seems to have that covered. The problem is that Dialyspa is only located in the Houston, Texas area. I’m in the Dallas-Fort Worth area. A five hour drive one way for dialysis is a bit much! However, I have another dream and that is the Dialyspa concept will expand to other providers and Dialyspa will expand geographically. Please note: I’m not endorsing Dialyspa. I’ve not been there. I’ve not received treatment from them. I am using them as an example of what I mean when I dream of dialysis and comfort and I don’t know of another dialysis provider approaching dialysis care here in the US as they are. I believe the ideal is somewhere between Dialyspa and the UK’s National Health System. Hopefully, that’s not in the middle of the Atlantic Ocean or just in my dreams. This entry was posted in dialysis, dialysis chair, dialysis equipment, ESRD, patient care, social networking and tagged dialysis, ESRD, hemodialysis, patient care, patient-centered care, patients, treatment. Bookmark the permalink. Hang on in there Devon and do what you can to make the centre comfortable. I spent some time in hospital in the UK recently, the wards were very clinical, there was alot of waiting (like 36 hours between a scan and the specialist coming down to the ward) but they were always pleasant and the nurses were really lovely. It must take a special kind of person to do the job they do. Gosh Devon, I don’t miss heamo, but we were catered for with tea or coffee, sandwiches or plates of food, whichever the patient preferred. The chairs were more like an electrical bed. We could change position with the click of a button. We got blankets and pillows for comfort. I used to hate lying there and also daydreamed about what I could rather be doing. At least with PD I’m at home and only dialyse while I sleep. Dialysis is crappy any which way. Hang in there, you are doing such an amazing job with all the info you provide. I wish I read your blog when I was a newbie, it would have helped me so much.